Gardening can break your heart. 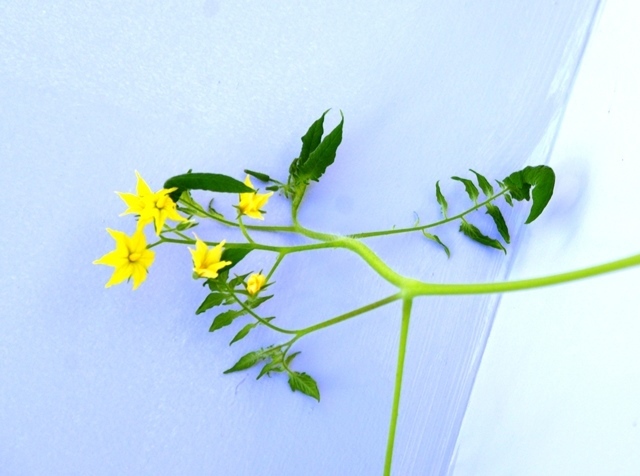 Having to pull out the shell of a plant that did not grow or thrive, for whatever reason, can be a very sad experience; and when some unknown, unwanted, or uncontrollable element impacts your garden, and runs wild, well that can almost be enough to make you want to quit – but only almost. 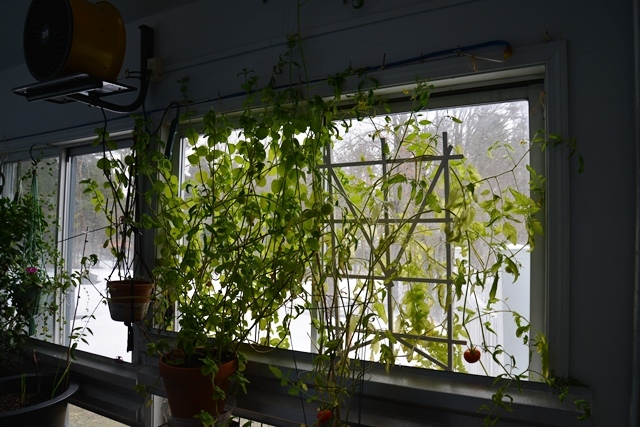 At the end of the normal growing season, last fall, my sister brought me two tomato plants, a zucchini, and a pot of strawberries, to winter with me, in my pool room. Soon thereafter, something went terribly wrong, and I began to lose various plants; resulting in that dreaded broken heart. 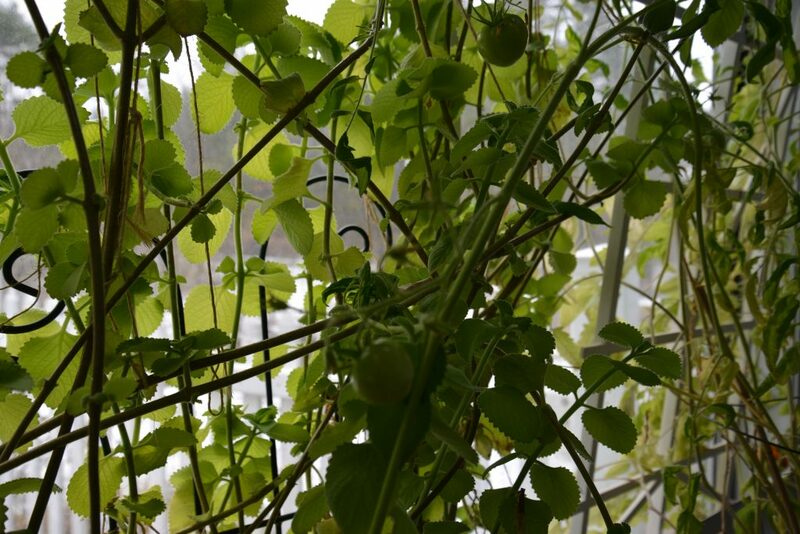 This branch is growing on the ceiling — can you imagine if they all turn into tomatoes! 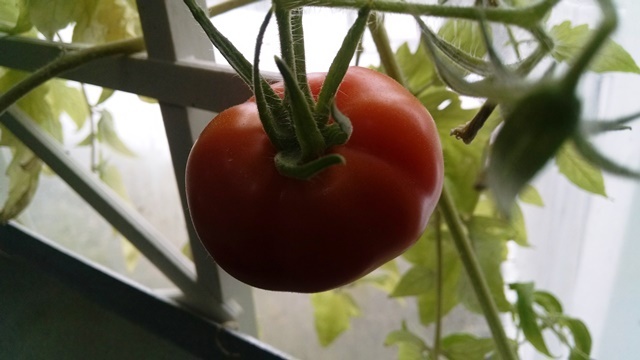 But a few days ago, I walked into my indoor garden, and saw this bright red tomato, growing on one of Caroline’s tomatoes! I had seen him when he first turned from a small yellow flower, into a tiny green, marble size ball, but the winter’s losses had made me cautious though hopeful. 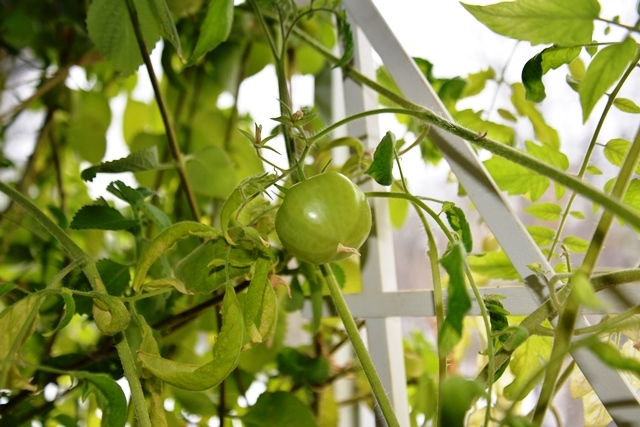 It is not unusual for a plant to set out fruit that will not mature; but not only did this little fellow hang in there, literally, he also set an example for several other pea size babies to live and thrive! Winter is not an easy season in North America; it can be challenging to wait for shoots of spring to bring us hope of warmer days and wonder, but a bright red tomato, against the back drop of snow, can certainly bring me hope! This entry was posted on February 21, 2018 at 12:01 am and is filed under Nature, SlideShow, Uncategorized. You can follow any responses to this entry through the RSS 2.0 feed.